Learning how to ride a bike is the biggest achievement a child acomplishes at a young age. It’s not an easy accomplishment either. I remember the mixed feeling I had from the anxiety of not wanting to part with my training wheels to the fear of falling down, I was petrified of failing. That’s why I was excited to learn about Strider, a company that has developed an innovative balance bike that eliminates the fear of learning to ride a bike. 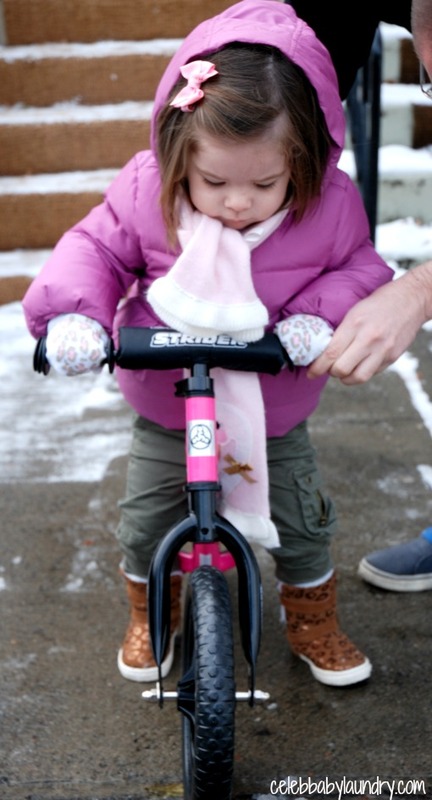 Strider Bikes helps children as young as 18 months old learn the basics of riding a bike. Also know as a ‘balance bike’, children learn the fundamentals of balancing, leaning, and steering, without the distractions and complications of pedals or training wheels. This unique design teaches young children to balance on two wheels right from the start which helps avoid developmental delays that are typical of tricycles and training-wheel bikes. 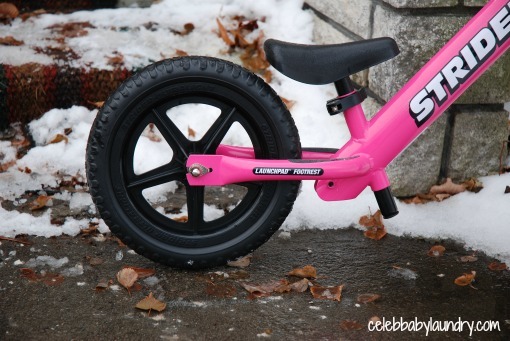 The ST4 edition of the Strider Bike is designed for children between the ages of 18 months to 5 years of age. It comes in a variety of colors and has a motocross bike design. The designers kept girls in mind too and designed a ST4 in bright pink! Upon opening the Strider Bike package, I was surprised to find out how easy it was to put together. My hubby and I are not exactly the fix-it or put-it together type of people, so it was definitely a relief to be able to put together the bike without any tools. Assembly took me about 10 minutes with a toddler running around excitedly. Adjusting the bike after assembly is easy too. The seat moves up and down with a simple lever which allows the bike to grow with your child. The same goes for the handle bar. The next day, my husband and I took the bike out so Ava could put it to the test. She was immediately curious to find out what ‘this new thing’ exactly did. I told her it was bike and that she had to sit on the seat which she did right away with my help. I was taken aback by Ava’s willingness because she is a definite contemplator. She tends not to jump into anything without feeling completely comfortable first. Once sitting on the seats, she realized that she would have to walk and hold the bike up at the same time to move forward. In essence, having to do this teaches her how to balance. Weighing only 6.7 pounds, the Strider Balance Bike is also designed to be super light for ease of handling by young riders. The handle bar adjusted to a perfect height for Ava and she had no problems picking up the bike. In fact, she actually enjoyed carrying the bike around the front of our house for the first time. To note, as Ava tested the bike out she became more cautious and wasn’t comfortable to walk that far. Like any new thing she will take time to feel fully comfortable, but once she does I have a feeling she will be hard to stop! I see her cruising around our park all next summer. As a parent, I’m more confident with Ava using a balance bike to help teach her how to ride a bike. She can learn how to balance slowly and will not have to jump head first into riding a bike. The Strider Balance Bike is a perfect gift for parents with toddlers who want to explore the world. The bike helps young children learn the fundamentals of riding a bike at a young age, but in a safe manner. At the moment, the ST4 bikes are priced at $109.00. 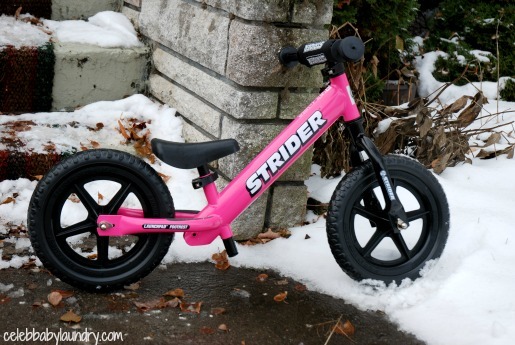 Visit Strider Bikes to learn more about their other type of balance bikes. Disclaimer: Celeb Baby Laundry has not received any payment as a result of this review. We were sent the product for the purposes of review. All products featured must meet Celeb Baby Laundry’s Holiday Gift Guide standards. All opinions are our own.